Increase your color printing productivity with the HP LaserJet Pro M281fdw color printer. Easily connect your smartphone or tablet directly to your printer and easily print. Wireless Ready: Wireless. 4.3" Color Touchscreen; USB Host Port. Print Speed: 28 ppm. Prices do change frequently. View International Policies. Print Resolution: 600 x 600 dpi. Print, Scan, Copy, Fax. Connectivity: Hi-Speed USB 2.0 port; built-in Fast Ethernet 10/100Base-TX network port; 802.11n 2.4/5GHz wireless; Walkup host USB port. Apple® OS X Sierra(v10.12), El Capitan (v10.11), Yosemite (v10.10); 1.5 GB HD; Internet required; USB Windows® 10, 8.1, 8, 7: 32-bit or 64-bit, 2 GB available hard disk space, CD-ROM/DVD drive or Internet connection, USB port, Internet Explorer. 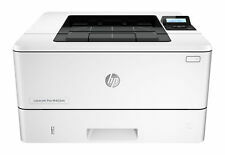 · HP Color LaserJet Pro MFP M477fdn. Grab pages and go—without waiting around. This MFP wakes up and prints faster than the competition. Count on professional quality at high speeds with HP ColorSphere 3 toner. HP FACTORY RECERTIFIED COLOR LASERJET PRO M180NW MFP 17PPM 600X600DPI 150-SHEET. Mfr Part #: T6B74ARBGJ. Check-Out Now! Trending at $198.46eBay determines this price through a machine learned model of the product's sale prices within the last 90 days. Impress with colour and increase efficiency. Print speed letter: Up to 22 ppm (black and color). Auto duplex printing; 250 sheet paper tray (standard). Mfr Part #: T6B60ARBGJ. Check-Out Now! UPC: 0191628477807. Model: M477fdw. Toner pre-installed by factory. We apologize for this inconvenience. Color: White. Color touchscreen. Pickup hours Kansas City, MO 64120. Model: M281cdw. Toner factory pre-installed. We apologize for this inconvenience. Color: White. Color touchscreen. Pickup hours Kansas City, MO 64120. Model Number: M180NW. It prints up to 17 ppm to complete jobs quickly, and its 600 dpi resolution produces crisp text and images. Ask your compatible device (separate device required) to print coloring pages, as well as various puzzles, comics, and coloring activities. Yellow 19 pages %100. PRINT SPEED BLACK. PRINT SPEED COLOR. Hi-Speed USB 2.0 port; built-in Gigabit Ethernet 10/100/1000 Base-TX network port; Easy-access USB. Black 43 pages %100. FIRST PAGE OUT (READY). Trending at $389.89eBay determines this price through a machine learned model of the product's sale prices within the last 90 days. MFP M281fdw. HP Color LaserJet Pro. Full 1 Year HP Warranty. Stay productive and change paper less often with a 250-sheet capacity paper tray. Print speed black : Normal: Up to 22 ppm. Print speed color : Normal:Up to 22 ppm. HP CF388A M452NW Color LaserJet Pro Wireless Laser Printer, POWER CORD, TONER, SOFTWARE CD, USER GUIDE. M452NW LaserJet Pro Wireless Color Laser Printer. Model: CF388A. Color LaserJet Pro. Toner Level =100%. Has genuine HP Introductory toners installed. 70% remaining on black. 80% remaining on all colors. Pages printed = 478. Yellow %70. PRINT SPEED BLACK. PRINT SPEED COLOR. Used Very Clean. FIRST PAGE OUT (READY). Hi-Speed USB 2.0 port; built-in Gigabit Ethernet 10/100/1000 Base-TX network port; Easy-access USB. Black: As fast as 8.9 sec Color: As fast as 9.8 sec. HP Laser Paper Mat 40 lb. (Part Used). Compatible Toner/Ink HP 410A Black, Cyan, Magenta, Yellow; HP 410X Black, Cyan, Magenta, Yellow. HP Laser Paper (Part Used). Hi-Speed USB 2.0 port. StarTech 14 FT CAT6A Black Patch Cable Shield STP C6ASPAT14BK. Wireless Print Technology: Google Cloud Print. Hi-Speed USB 2.0 port; Built-in Fast Ethernet 10/100/1000 Base-TX network port, 802.11n 2.4/5GHz wireless; Fax port; Front Host USB. Make an impact with high-quality colour and increased productivity. We apologize for this inconvenience. 2.7" color touchscreen. We are not an authorized dealer of this product and any warranty included with the product may not be honored by the manufacturer. Print direct from USB. Part Number. Orders that exceed listed availability will automatically be voided without notice. SNO-T6B74AR#BGJ. P/S: This is a Printer so this is a professional type Color LaserJet Pro M452nw. Model: M452nw. Includes Printer, Toner Pre-Installed, USB Cable, Power Cable, CD Disc & The Instructions. Toner Is Pre-Installed. Print Resolution: 600 x 600 dpi. Connectivity: Wired & Wireless. Printing Technology: Laser. THE PRINTER HAS BEEN TESTED TO TURN ON. I BELIEVE THE LOWER PART OF THE PAPER HOLDER IS MISSING BUT THE PAPER DOES NOT FALL. 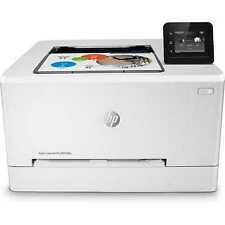 · HP Color LaserJet Pro M452nw. Count on professional quality at high speeds with HP ColorSphere 3 toner. Set up this printer fast and easily manage device settings to help increase overall printing efficiency. 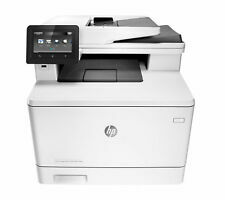 HP LaserJet Pro M251nw. Works great. Nothing wrong. Fully functional. There is also toner already loaded in printer. See picture, toner levels show. 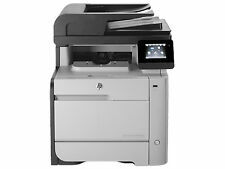 Works perfect HP Color LaserJet Pro M452dn Printer W Duplex Printing. Wireless and cloud ready Easy installation Has toner and drum in it but not sure how much is actually left. Condition is Used. Shipped with FedEx Ground or FedEx Home Delivery. This unit printed several pages however there are very light markings on the lefthand side of each test print. Since we don't have spare toner to test with, we can't confirm whether this is caused by the printer or replaceable supplies. HP LaserJet ProMFP M130fw. 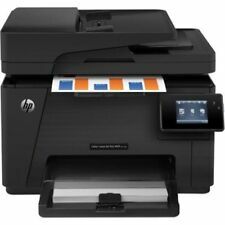 Print, scan, copy, and fax with a compact HP Laser Jet MFP that fits into tight work spaces. HP quality—print after print. PO BOX or APO BOX or FPO BOX. US TERRITORIES, such as PUERTO RICO or GUAM. Hi-Speed USB 20 port; built-in Gigabit Ethernet 10/100/1000 Base-TX network port; Easy-access USB. FACTORY SEALED REFURBISHED UNIT. Letter: Up to 25 ppm black; Up to 25 ppm color. First Page Out: As fast as 89 sec black; As fast as 98 sec color. I used this printer lightly in a residential setting for the last few years, and it was amazing. Connected via USB, it has native driver supportin Windows and OSX until the latest version; on the latest version of OSX the Project Gutenberg driver works well for black and white, I never tried it with color (all features, including color work great over the network on the latest OSX). 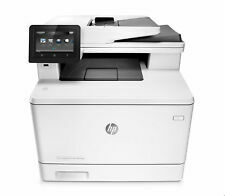 Brand HP LaserJet Pro M254dw Color Printer Model B4A22A Wireless W Ink Tested. Condition is Used. Only slight blemishes in rear from wiring. Shipped with USPS Priority Mail. Comes with power cord Note: Last year due to unforeseen circumstances I was not able to attend to some orders in timely manner. Health is good now and we will ship ASAP. We are here to answer all your questions in a timely manner. Thank you for your understanding. Whether you need a home printer or a business printer, laser printers provide faster printing for your print job with either wireless connectivity or via USB. 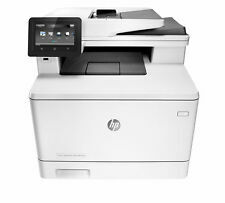 HP, a trusted technology company makes an HP LaserJet Color printer that works for printing presentations at home or for printing brochures to market your business. After you press Print, your printer repeatedly passes a laser beam back and forth over a negatively charged drum to create the print or image that you want. The drum attracts positively charged black or colored toner powder, which is stored in a cartridge and transfers the image to paper. As the paper goes through the rollers, it is heated to permanently fuse the text and/or image that the laser made to the paper. What can you do with your LaserJet Pro Printer? 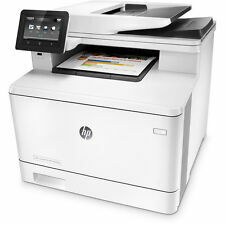 Your HP Color LaserJet gives you the opportunity to print any project that you would on an inkjet printer, but it will typically be faster, whether connected via USB or wireless connection; however, some LaserJet printers have the capability to fax, scan, email, and copy documents. These multifunctional LaserJet printers are called MFPs or all-in-ones, and they offer a higher level of convenience than a standard color printer. How does a printer connect to a computer? Depending on which HP LaserJet Pro Color model you have, you can connect the printer to your computer in four ways. For a traditional hard connectivity, you can connect via USB. Many printers also have wireless and Bluetooth capabilities. Work-group laser printers often connect via Ethernet. What happens when the toner cartridge runs out? Replace: Trade out the empty cartridge with a new cartridge that is compatible with the specifications for your printer. Refill: Refill the cartridge with the necessary color. Color laser printers have four different toner colors: cyan, magenta, yellow, and black. A refill kit includes powder for all colors and the tools you need to go through the refill process. What does the PPM rating mean on a printer? The PPM rating on your printer tells you the speed that your printer can print a page of text without graphics in black ink. HP LaserJet Pro Color printers range from 10-49 PPM. If your printer has a rating of 30 PPM, it means that the printer can print 30 pages of text per minute. You will find that a strong USB connection will give you the maximum PPM for your printer.